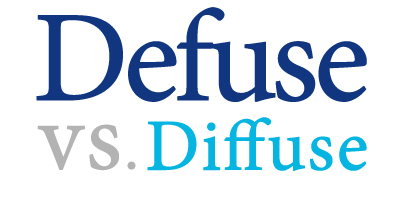 Defuse vs. Diffuse: What’s the Difference? Home » Defuse vs. Diffuse: What’s the Difference? Some words in English sound the same, even if their meanings are different. These words are called homophones. Diffuse and defuse don’t sound exactly alike when pronounced carefully, but they are near homophones. They do, however, have quite distinct meanings, and mixing them up can cause needless confusion for your readers. As a result, it’s important to know whether you really mean defuse or diffuse. In this article, I will compare defuse vs. diffuse. As part of this explanation, I will use each word in a sentence to illustrate its proper context and meaning. Plus, I will relate to you a useful memory tool to help remember when each word is appropriate. What does defuse mean? Defuse is a verb. To defuse something is to disarm an explosive, or less literally, to alleviate danger. The speaker used humor to defuse a tense situation. “Disconnect the red wire to defuse the bomb!” yelled the frantic technician. What does diffuse mean? Diffuse can be an adjective or a verb. As an adjective, diffuse means spread out, scattered, or softened. It can refer either to the intensity of light, or to a lack of concentration, e.g., of a people group over a large area. Diffuse light emanated from the crystal ball. The diffuse vegetation broke up the otherwise featureless tundra. As a verb, diffuse means to spread or scatter. It also refers to light but can refer to more abstract concepts, like the spread of knowledge throughout the world. In this sense, it is a close synonym of disseminate. The light diffused through the curtains, creating a soft ambiance in the quiet room. Adding a lampshade over a light bulb will diffuse the light, so that it will not be so glaring. The advent of the printing press diffused literacy over the entire civilized world. Now that we understand each word’s context and meaning, let’s go over a helpful trick to remember diffuse vs. defuse. Defuse refers to the disarming of a bomb or the alleviation of tension or danger. Diffuse refers to a quality of light, the scattering of light, or metaphorically, the spread of an idea or another concept. Humor can cause the tension in a room to diffuse. From a certain point of view, an argument could be made that this sentence is an appropriate use of diffuse. The tension could be said to have softened. Remember, however, that something that is diffused is also spread or circulated. You would not typically tell a joke to spread tension. As a result, to use diffuse in this context isn’t really correct and would probably confuse your readers. You can remember to use defuse for situations involving explosives or a high amount of tension since defuse and deescalate each start with the letters de-. Deescalate is a rough synonym of defuse in such situations. By using this mnemonic, you can always know whether to choose defuse or diffuse. Is it defuse or diffuse? These two words, despite sounding somewhat similar in speech, have entirely distinct meanings. Defuse is a verb that means to disarm an explosive or relieve tension from a situation. Diffuse is an adjective referring to a lack of concentration, or a verb that means to spread out or to circulate. Since defuse and deescalate start with the same letters and both refer to relieving tension, you can remember to reserve defuse for these situations. If you ever need help deciding to use diffuse or defuse, you can check this article for a refresher. 1 What is the Difference Between Defuse and Diffuse? Amount vs. Number: What’s the Difference?